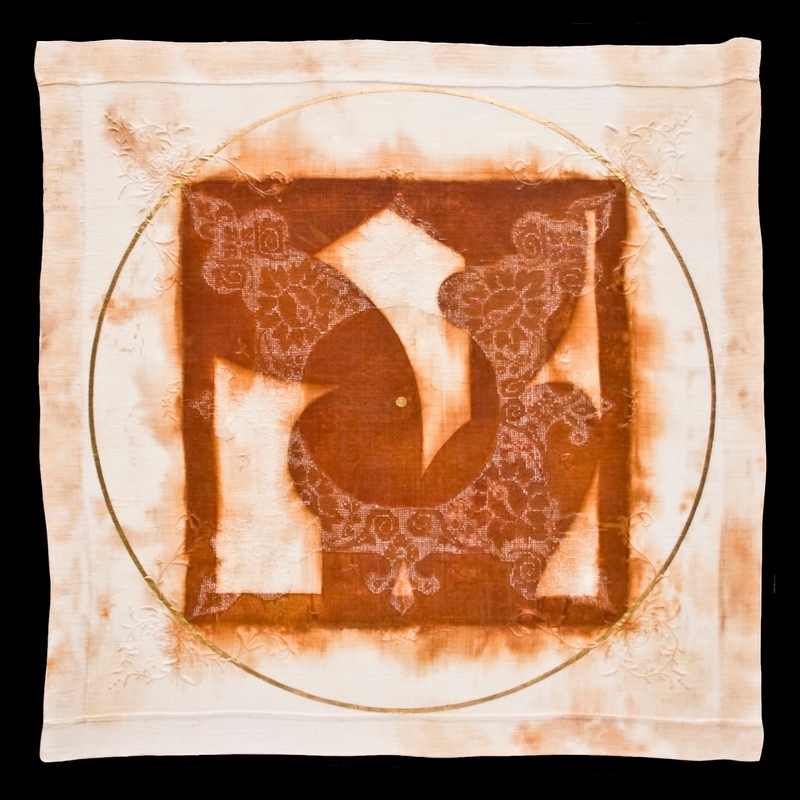 This is "Omphalos", a Rust Monoprint with Gold Leaf, mounted to a coped dimensional panel. It's dimensions are approximately 36 x 36 x 1 3/4 inches. I made it by rusting a water-jet cut Cort-en steel plate onto/into an antique linen tablecloth. Omphalos means navel, as in belly button, (umbilicus in Latin) and it also means "The Center." The Omphalos Stone at the Temple of Apollo in Delphi Greece marked the center of the old Greek world. Each culture has its recognized center. Sometimes more than one. For instance, the USA's political Omphalos would be the White House in Washington DC and cultural center might perhaps be Rockefeller Center in New York City (or not). In every culture it depends on who's telling the story! If you would like to see "Omphalos," the current center of my world, please visit the annual Seattle Print Arts Members Exhibition, Pressing On, with an opening reception today, Thursday, November 17th, 5-8 pm, at the Schack Art Center in Everett (2921 Hoyt Ave., Everett, WA). You will find "Omphalos" and some exceptional work by the members of Seattle Print Arts from November 17 - December 24.